Giti Tire is kicking off 2015 with some really exciting news! 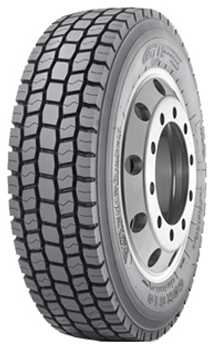 Starting in January and running through midyear, the company will be introducing five new state-of-the-art, next-generation GT Radial commercial tires in North America. •	The Smartway-verified long-haul GT669+FS drive and GT979FS trailer position tires will be replaced by the GDL617FS and GTL922FS designs. •	In the regional category, the GT668 is being replaced by the GT639. •	In LTT 17.5- and 19.5-inch diameter sizes, the GT678 will be replaced by the GDR619. •	For mixed service applications, the GT01 is being replaced by the GAM835. “This is the most extensive upgrading of our commercial tire line-up ever in North America, and we’re confident our dealers and their customers will be thrilled with the performance of these next-generation products,” said Patrick Gunn, Director of Sales and Marketing, Commercial Tires, for Giti Tire (USA). Contact your GT Radial representative for details on these exciting lineup changes for 2015 and look for product launch information as each product arrives in the Giti Tire distribution centers and becomes available for order.